I’ve been sad lately because I couldn’t play Badminton…no not because I was grounded but because I was having some pretty nasty wrist pain which limited my wrist rotation and flex. I thought it could be Carpal Tunnel Syndrome or Repetitive Strain Injury, but not being a doctor I wasn’t really sure. Obviously caused by too much wanking typing/mouse use in the wrong position, I bough a new Fellowes gel mouse mat for the office to remedy the problem as I already have a nice ergonomic setup at home with my Ergohuman chair! Then I need to fix my wrist itself, I was considering heading over to Osso Bone Care, but it’s just too bloody far! 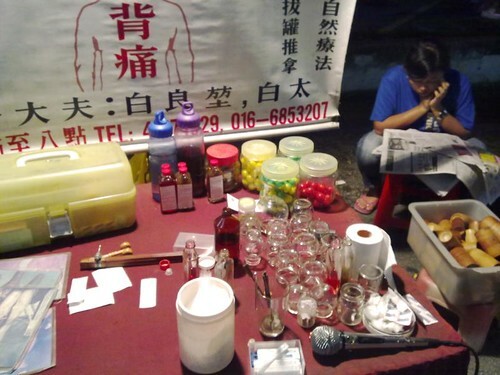 One night I happened to be in Cheras at the Pasar Malam and I saw one of those random Chinese medicine counters in the middle. I thought why the hell not just give it a try. After that she promptly jabbed me with a rather sharp needle. It didn’t really hurt but it was a bit ticklish when the needle reached my tendon..she twisted it and turned it and poked it for a while then left it there. After that she gave me a vicious massage with some dit da jao (bruise wine) and applied another type of tincture onto some tissue and wrapped it around my wrist. There were two kinds, one red and one brown. The red one was to be massaged after showering, then the brown one applied to tissue paper and wrapped around my wrist. You can see the bottles in the middle of the table. She also offered to sell me some kind of medicinal pills in little colourful plastic capsules (you can see on the right of the table) which were rather expensive..
Of course I declined those. Total damage for the treatment (including acupuncture and application of gauze treatment) and two bottles of dit da jao? RM20! Cheap as chips if you ask me. She asked me to keep up the treatment for a week and keep any weight off my wrist and it should be fine. 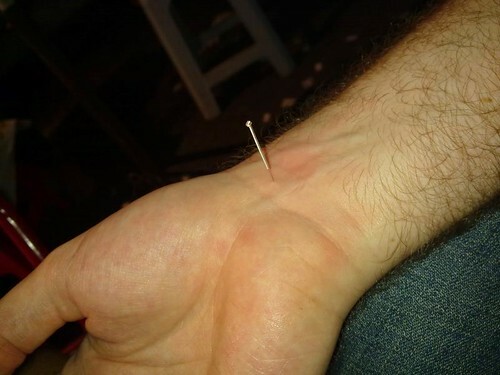 It felt immediately better after the needle poking and massage and I’d say by the end of the week my wrist was 80% recovered. I’d say by now it’s about 95% ok, it’s still doesn’t feel quite 100% but I’ve gotten back almost 100% rotation on my wrist and it doesn’t hurt under normal circumstances any more. Power to the pasar malam treatments I say. Thanks for trusting the power of TCM.. I think i need one for my waist and lower back… Whc pasar mlm was it? Tmn Connaught? Eeee..my wrist also pain but i scare. Keng! Kengggg! Ouch! i salute u. . .i wouldnt dare taking the risk of their treatment. . . .
woah! would try that one day! Damn man ST, you seriously got guts lol. Don’t think I would even dare try it. 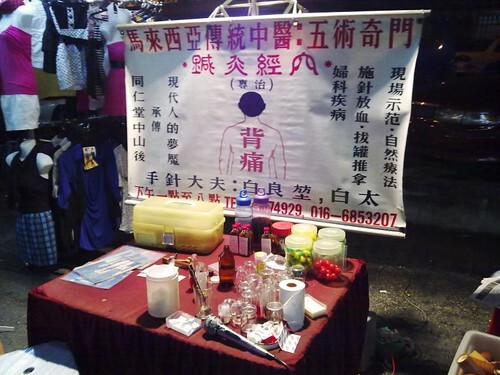 Not to mention the pasar malam bit, I don’t think I would even try the normal acupuncture from licensed clinics. Acupuncture is not a proven treatment in western medicine but many people have benefitted it. Some doctors said that poking needles into your body creates an endorphin rush, thus causing you to feel better in a short duration. suanie: Don’t scare, it’s teh stims! KY: Haha for advertising la. Ndmervin: Sunday night is Taman Muda, can probably find the same stall at different markets on different nights tho. Lainie: Can try go to Osso if you want to avoid the needles, they are very good too. foodcrazee: I don’t see why not, if no benefit then no harm done. 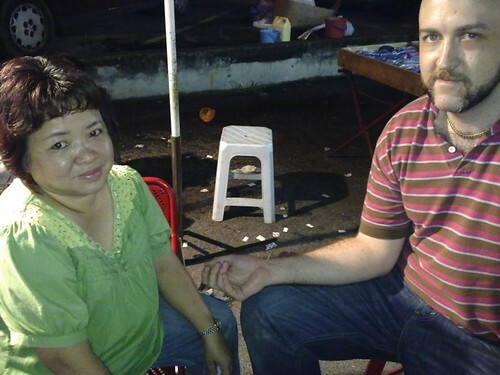 Mark Leo: No need, having one gwailoh sitting there at her stall already gathered quite a crowd. julian: Hmm interesting thanks, will have to do more research on that. 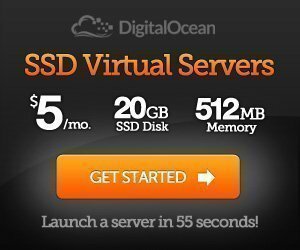 xes: It’s worth a shot! Mellissa: I think I too might draw the line at having needles stuck in my face. kaswira: The chance of hermetically sealed needles being contaminated is the same as those in the doctors surgery. JaCJaC: Yah just whack only la. Meng: There are a lot of things Western science doesn’t understand or can’t prove – that doesn’t make it invalid. Azizul: Yup, sometimes gotta do what you gotta do. As for beating Chong Wei…don’t hold your breath. charles: Yes, an important lesson.